The Water Project Trek 2017 team exceeded their target of raising £10K by a few thousand – amazing work, well done!!! Their trek saw them going to Kanchenjunga north and south base camps. The money raised will mean that we can supply water to the last seven schools in our programme in the Taplejung region that didn’t have water yet and we can also provide water to the clinic in Lelep. Thank you Robin, Chris & Bella, Keith, Nigel, Taff, Nik, John, Sarah, Alastair, Des, Mark, Dai, Rob, Roger, David and Celeste. They kindly wrote a report for us. 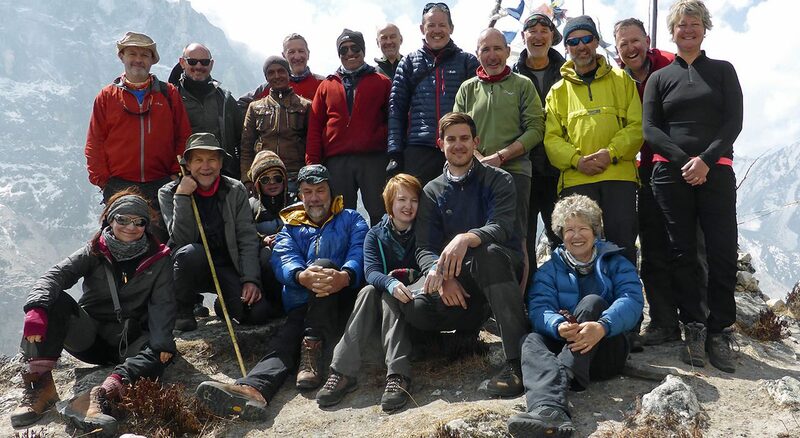 In April 2017, a group of 17, in the main Worcestershire-based and friends of HTUK Trustee John Walton, led by Robin Humphreys and Chris Johnson visited the Kanchenjunga region, trekking from Taplejung to the South and North base camps of Kanchenjunga. It was a memorable trip in which they experienced all four seasons in three weeks but had the benefit of some magnificent mountain scenery, fauna and flora and lasting encounters with welcoming local people as they trekked though some of the most remote and impoverished villages and communities in this part of Nepal. In advance of the trip and in liaison with the Trust, through a range of fund raising activities and direct donations, the group raised over £12,000 for the Trust’s project to supply fresh water to seven schools and an electric supply to a clinic in the region. Highlights of the trip included meeting with REED, the Trust’s partner in the region, and visiting and seeing at first hand the primary school at Yamphudin which will benefit from the group’s fundraising with the supply of water to the toilet and standpipe in the school grounds later this year, both currently out of action. Robin commented, ‘we saw some fantastic mountain scenery and had a memorable experience trekking in the high Himalayas, but along with that a large number of children will now have the benefit of a fresh water supply and so improve their health, hygiene and learning experiences in their school. It was a great but humbling opportunity for the group in a small way to give something back and to be able to make a lasting contribution to the communities through which we were trekking’.